The H Factor: A Huntsville Tradition Renewed Every Fall: Huntsville Hornets' Friday Night Lights is Back! 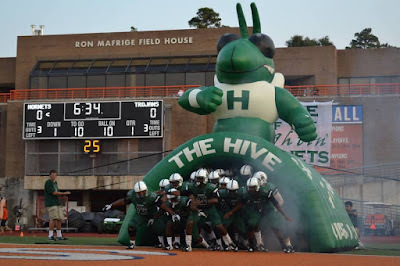 A Huntsville Tradition Renewed Every Fall: Huntsville Hornets' Friday Night Lights is Back! 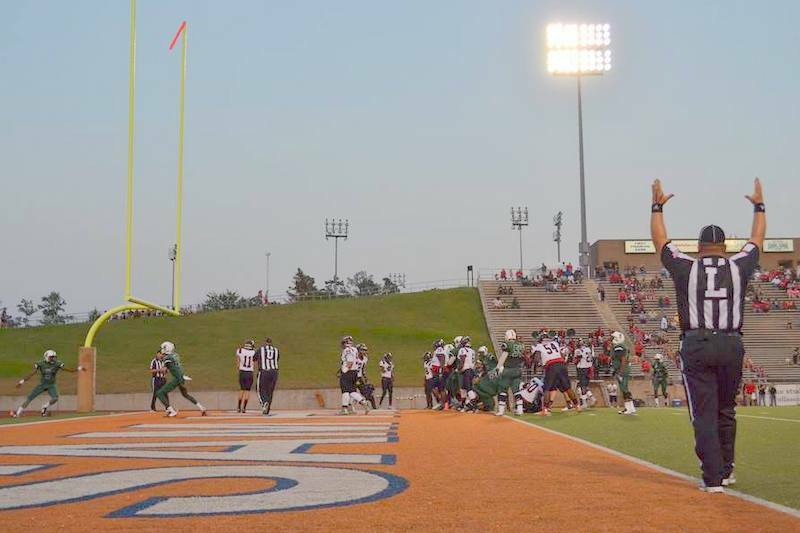 This past Friday night, Huntsville ISD's beloved fall tradition was renewed once again. 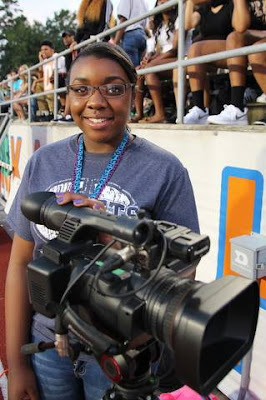 School is back in session, and it's Football Season! 56-12. 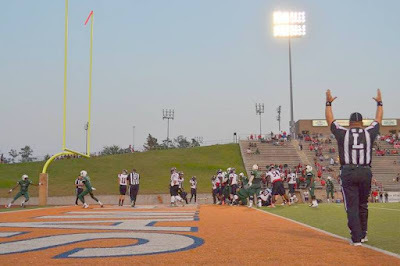 Now if you are looking for a play by play recap, you would be better served heading over to The Huntsville Item's coverage or catching Kooter and Leroy on KSAM, 101.7. But if you are in the mood to check out some of the action OFF the field, including some of the families, friends and fun from Friday then you've come to the right place! Some ladies of the Grenadier Guard helping each other get things 'just right' before the game. is attending his first Huntsville High School football game! Let us off so we can play! These band members are ready for the first game of the season! On the sidelines: no one said it would be easy. The Huntsville Hornet Military Marching Band. Welcome to the Hornet Experience! These Huntsville ISD teachers hung out with the team and coaching staff all night, beginning with the game night meal. They enjoyed watching the game from the best seat in the house- the sidelines! Date Night! Mance Park's Lateel Richardson and her husband Roderick enjoy each others company, and the game! OK you can take our picture-just be cool about it, alright?! was there rooting for the Hornets with her husband Doug and daughter, Maggie. A few rows away, fellow Employee of the Month Mike Wallace, our District's Technology Systems Administrator enjoys the game with his wife, Angela (of Huntsville Elementary) and family, aka "The Wallace Bunch"
The Football Team kept the Flagmen running all night! and it didn't matter if they had seen each other last week or last year- it was just good to see them again! Here Huntsville Elementary's Freda Shaw is with Patrick Antwi the President of the Huntsville ISD Board of Trustees. Huntsville High School's Dean of Instruction Karen Murdoch and Assistant Principal Demeka Simmons. It's a Friday during football season, and they're having fun with friends at the game. The Huntsville Hornet Military Marching Band performs during halftime- it was superb! A Proud Coach: Mrs. Dana Lenorman watching the Grenadier Guard perform to Katy Perry's "Dark Horse." It's a classy tradition- The cheer teams visit each other sides and cheer for their opponents. (Photo Courtesy of Chloe Weich and the Huntsville Hive Online. Date Night Continued! Huntsville High School's Jack and Sammi Herrington. The GG's all lined up in first position. Buzzy high fives the fans! Let us chill here for a moment! If it's Third Quarter, then it means that the band may get a break before it's "back to work" in the Fourth. Koren Nicks with daughter Makinzie of Samuel Walker Houston. but don't try you try to sit where you aren't supposed to sit! After the game, tired, but not too tired to sign the school song! And Another Date Night! This one with Quentin and Brenita Jordan. After the game and the team is feeling pretty good! All eyes on him. Coach Southern has a quick post game meeting on the field. See you at 9:00 a.m. sharp tomorrow! What a beautiful new scoreboard @ Bowers Stadium! These guys are ready to go! The Dukes are Hornet Buddies! These police officers are part of our Hornet Family! Wow- and this was just in practice during warm ups! Here are most of the trainers- the two missing were working in the locker room! The Huntsville Hornet Military Marching Band is entering the stadium. Huntsville High School's Tom Farr and his kids- let's take the picture so we can get in there! Wave the Flag of Huntsville High! ...as well as photographers from The Huntsville High School Yearbook staff. And of course The Hive daily announcements!! Coach Southern watches the action.